Okay so before I properly introduce her, I should probably tell you the story! After getting very into the Cheltenham festival this year I became a bit obsessed with the idea of being more involved in racing. I was particularly inspired after hearing an interview with some of the owners of Pentland Hills who I had backed to win. They said how they had bought a share in him for Christmas for just £56. Not being able to afford a horse by myself I had always been interested in the idea of a syndicate. But it was only after hearing from these syndicate owners of Pentland Hills I decided to look into it properly. I started by visiting the Owners Group, the syndicate company who own Pentland Hills. I had a bit more of a look at what is involved and the benefits before looking at a few more syndicate companies. By this point I was sold on the idea of joining a syndicate. Now I just needed to find one what was affordable for me and a horse I liked the look of. With most syndicates consisting of 50-100 people, the shares were £100+ a month. So I soon ended up back on the Owners Group website where syndicates consist of 3000 people making them much more affordable! They had 3 horses available at the time and Paris Dixie just stood out to me. So let me properly introduce Paris Dixie! 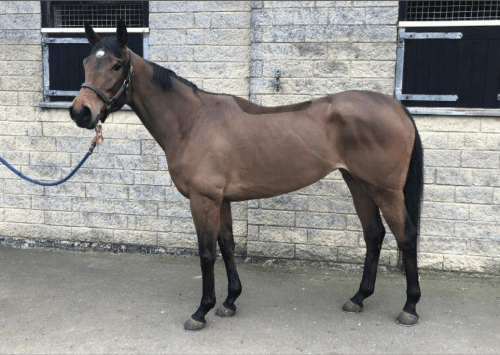 She is a 4 year old filly who has only recently been purchased by the syndicate and will be starting training with the one and only Nicky Henderson! She has so far run in 4 bumpers (National Hunt flat races) where she has two 3rds and won her most recent outing. The jockey for her winning race also rode Scottie for the majority of his races, so that was nice to see! She is also by Champs Elysees who is believed to be a promising up and coming sire in National Hunt racing. The hope is that she will go novice hurdling next season but we will have to wait and see. As part of my ownership I will get weekly updates from Nicky Henderson on her progress plus regular video updates from the syndicate group. So that in itself is incredibly exciting! I’ve had my first couple of updates already, basically letting me know that she has settled into the yard and they will starting to work with her soon. Other benefits of owning Paris Dixie include free stable visits to Nicky Henderson’s yard getting to meet her as well as some of the other horses! There is also the chance to get owners badges for the racecourse when she is running. Since this is such a big syndicate, not everyone can have tickets to every race, so they are balloted I’m guessing to the people who show an interest in that date. But hopefully I will get at least one chance to see her in the parade ring and enjoy the owners benefits at a racecourse! If not I do plan to attend some of her races either way! I will also get my share of any prize money she wins, a monthly magazine and alerts every time she is declared to race with a comment from Nicky Henderson as to how he thinks she will do. It’s still very early days and it’s probably going to be quite a while until I have some exciting updates about her. But I am just really excited and wanted to introduce you to her. Should you trim horses whiskers?